One of the highlights of this past year just might have been that I was broadcast across Rwandan national television – during prime time, no less. The occasion for such an honor? Rwanda Day in Atlanta, Georgia last September. The first reason I went to the Rwanda Day 2014 convention was out of solidarity for “my sister” and best friend since our first year of college, a beautiful young Rwandan woman. (She had recently moved to take advantage of a job opportunity and it was impossible for her to attend.) Through her eyes, I had come to love the country of Rwanda, its people, and its customs. I am very proud of what Rwanda has achieved in the 20 years following the genocide and I wanted to celebrate its growth. The second reason I went was sheer curiosity. 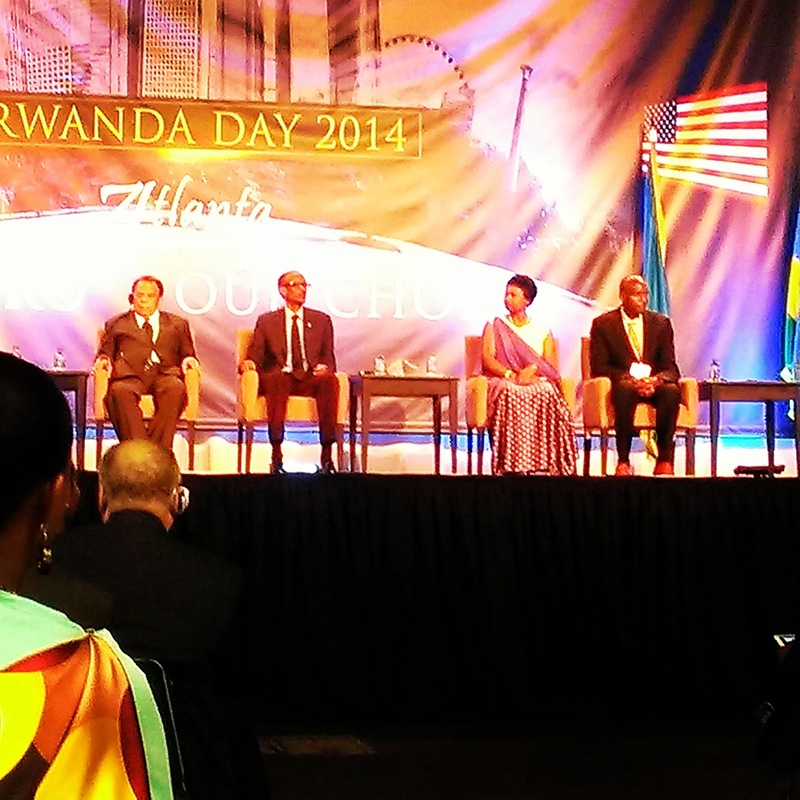 I was aware that this occasion served as what could be described as a “propaganda event,” drumming up support for the Rwandan government within the country as well as the worldwide diaspora by hosting a convention in the United States. It was indeed a very interesting two-day event. I was one of the lone Americans to attend. Most of the attendees were a part of the diaspora, but hundreds of them had actually flown all the way from Rwanda to engage in the festivities. (Interestingly, many of them did not speak any English, whatsoever.) I had several friends in attendance and many others recognized me from Facebook photos of our mutual friends – ensuring that I was never really alone. Moreover, many who didn’t know me at all used my presence as an opportunity to practice their English, which I welcomed. One of the aspects that stuck out to me was that at the end of each panel discussion, there was a Question-and-Answer session which lasted just as long as the panel itself. I quickly came to recognize that this Q&A session was not like one that you would find the United States - it was an individual’s opportunity to stand up, praise the government, perhaps make an appeal, and attempt to attract attention, as it was ultimately a venue in which they could be seen by their government officials. Yet, during the Q&A no one seemed to be taking the opportunity to ask any tough questions. That’s when I stood up to the microphone (inadvertently being broadcast across Rwandan national television, as I did so.) I politely asked what the government was doing to ensure that young, educated Rwandans could acquire the jobs currently being held by foreigners. (I didn’t mention the ethnic part – I know Rwanda well enough to know that that particular topic is off-limits, except behind closed doors.) I didn’t expect an answer – and they really didn’t provide one. I stood up because I knew that this was an issue affecting all of my Rwandan friends. I also knew that an American asking such a question would get some attention and it just might show the government officials that there are people in the West who are examining Rwanda under a critical lens. During the following break, people kept coming up to me. Rwandans (both living in the United States and in Rwanda) thanked me for asking the question, saying that it was important for their government to address. But yet it was clear to me that although they wanted it addressed, they were unwilling to ask the question themselves. Perhaps only a non-Rwandan could get away with it without seeming ungrateful. Each time I write about Rwanda, it becomes more and more difficult. Interestingly, it is like my relationship with the United States: I love it and I am proud of what it has accomplished, but at the same time I recognize a great number of problems and challenges. However, it is easy to criticize the superpower of the world; it is a lot more difficult to criticize a small, landlocked African nation which experienced one of the most horrific genocides of our time just 20 years ago and somehow was able to move past these impossible obstacles to achieve an extraordinary level of development. However, without challenging the country to face its problems head-on, how will it continue to grow? This is a pertinent topic because this conflict is what has hijacked nearly all of my reading on Rwanda: there are pro-Rwanda books or anti-Rwanda books – very little literature is respectfully in the middle. There are books praising the country’s President Paul Kagame or scathing him instead. In fact, I actually found myself reading one of the most controversial books in Rwanda’s modern history without even knowing it, An Ordinary Man by Paul Rusesabagina, the man whose story served as the inspiration for the Hollywood blockbuster, Hotel Rwanda. When I told one of my Rwandan friends that I had read it, his jaw dropped in disbelief as he shook his head, “Emily, that’s a really bad guy.” He refused to say anything more when I questioned him on it, saying that he hadn’t read the book and couldn’t criticize Rusesabagina knowledgeably. 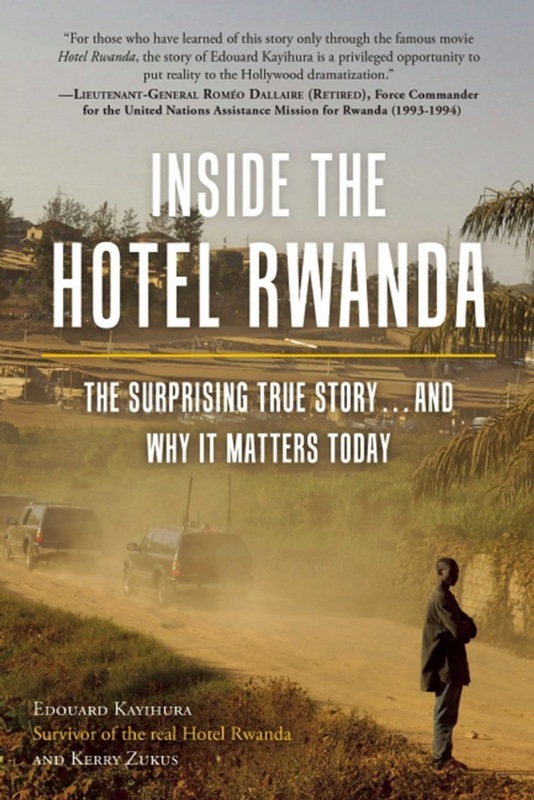 Subsequently, I decided to purchase and read, “Inside the Hotel Rwanda: The Surprising True Story…and Why It Matters Today” by a survivor of the real Hotel Rwanda, Edouard Kayihura, with help from the author Kerry Zukus. The purpose of this book is to dispel the legacy of Paul Rusesabagina, by showing that he is not the hero that he claims to be. I found this section of the book very compelling and even found myself agreeing with the authors reasonable claim that “Had Paul Rusesabagina never lived, every one of us who took refuge in that hotel and is still alive would still be alive.” (page 168) The second half of the book is dedicated to giving a history of how Hotel Rwanda came to be and how fraudulent claims of heroism could be picked up and celebrated by Hollywood. It is an interesting story – leading to Rusesabagina’s ultimate personal enrichment on the selling of his story of genocide and formation of a political party against Kagame. It is worth noting that “Rusesabagina could be extradited to Rwanda to face charges of assisting terrorism and threatening state security” (page 216), due to the many seditious things he has said in recent years regarding the genocide, the Tutsi group, and Paul Kagame. While several parts of this section were enlightening – such as Rusesabagina’s gradual narrative transition from “we” to “I” when discussing the heroes of the Hotel Rwanda (indicating his initial semi-honesty and sense of community) and quotes of increasingly extremist rhetoric while disparaging the Kagame administration – I found this section to be quite saturated with ethnic rhetoric; making me uncomfortable. One mild example was referring to the genocide as “the Genocide Against the Tutsi.” While I know that ethnic Tutsi were by far the majority killed in the genocide, I felt as if this decision marginalized the politically moderate Hutus, who were also killed during this conflict. The book ends on a hopeful note: “It is a new day for both the Tutsi, as well as the Hutu. A phrase now gaining favor in my native land is, ‘I am not Tutsi; I am not Hutu; I am Rwandan.” (page 247) While I love the sentiment of this message – and I have heard it hundreds of times from my friends – I am not convinced of its validity. I am friends with both Tutsis and Hutus (and even a mix of the two.) With my limited knowledge of Rwandans, I can identify ethnic groups with surprising accuracy by their interactions with one another. My initial suspicion is typically confirmed by asking less than five questions about their personal history. If I can do this as an American, I can only imagine how much more prominent it is among Rwandans and how much society is still dictated by ethnicity, even if it is not being spoken out loud. Your analyze is surprisingly accurate. I only hope that the youth in Rwanda (20 years and under) will overcome the ethnicity issue once they are given equal opportunity in education and employment. Thank you for sharing your views. This was a really amazing book since it focused on some of the most important stuff about this world. Will read it again when I find the time to do so. Thank you for sharing the post. I hope in the future, ethnicity issue won't be the the most famous thing people know about Rwanda anymore.